Make the office a wonderful place to love in! Bunny Watson (Katharine Hepburn) heads up the research department at the Federal Broadcasting Company, a major TV network. And she does her job very well, thank you very much. Assigned by the network president to introduce computers into some of the department's functions, Richard Sumner (Spencer Tracy) arrives at Bunny's well-run division to observe daily activities. Unfortunately, however, Sumner is ordered to keep his mission secret. As a result, the whole staff believes they are being replaced. To make matters worse, there appears to be more than a little electricity between Bunny and Sumner, which upsets Bunny's boyfriend Mike (Gig Young). 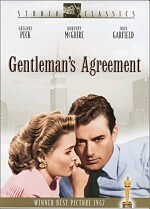 As the tension mounts in the office, so do the laughs in this classic romantic comedy. Some movies age better than others, and 1957�s Desk Set shows all the hallmarks of a badly dated film. However, in spite of those issues, it managed to offer a surprisingly light and enjoyable romantic comedy. We meet the absent-minded Richard Sumner (Spencer Tracy) as he goes to meet with Federal Broadcasting Company president Mr. Azae (Nicholas Joy). Due to his scatter-brained nature, Sumner shows up a day early, so he goes to check out the network�s research department; we figure out that his freelance job will connect to that group, but the reason for this remains hush-hush. 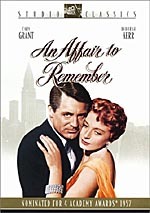 A kind of efficiency expert, Sumner goes to chat with research department chief Bunny Watson (Katharine Hepburn) but he makes sure he stays evasive about his work although he�ll need to spend a lot of time in her office. We also meet Mike Cutler (Gig Young), Bunny�s workaholic supervisor and tardy paramour who seems to take her romantic interest for granted. He invites her for a weekend away but inevitably needs to cancel due to work. In the meantime, Sumner and Bunny get to know each other. He gives her some cognitive and memory tests and she reveals that she researched him. She indicates she knows he advocates an �electronic brain� called EMMARAC, and she relates a rumor that she might get canned when the machine takes over their department. Obviously this causes suspicion, but Bunny and Sumner still become fairly chummy. When he catches a cab with her, he comes up to her place to change his rain-drenched clothes. Cutler�s trip gets delayed and he �catches� the two of them together. The rest of the film examines their low-key love triangle while it also explores the fate of the research department in the face of technological innovation. On the surface, Desk Set probably should stink. After all, it presents a very minimal story, as it includes little to move along the tale. The movie focuses on a small part of the world with a limited roster of characters and moves at a slow pace. All of this feels like a recipe for boredom. However, Set works surprisingly well, though it can be hard to pin down the reasons for its success. Obviously Hepburn and Tracy earned a well-deserved reputation for their talents, and they work together reasonably well here. Despite the differences between the characters� personalities, they mesh nicely enough to seem real and like a believable couple. No real sparks fly, but they�re not necessary in such a quiet little flick. Boy, does Set move at a slow pace, and normally I�d regard that as a problem, especially since the characters don�t really evolve terribly well. I don�t think we know them or understand them any better at the end than at the beginning. Nonetheless, the languid progression works in the film�s favor. It enjoys its dilly-dallying and lets us invest in the characters. They don�t do all that much to endear themselves to us � don�t expect much crisp and crackling dialogue � but for some reason their interactions remain enjoyable. On the positive side, the movie nicely underplays the characters� quirks. We don�t get constant examples of Bunny�s superlative memory or Sumner�s forgetfulness, which helps make them feel more like real people. In addition, the film doesn�t present them like a couple fated to be together. Since Cutler comes across as rather self-centered and moderately unlikable, it doesn�t seem like a stretch to predict that the flick�s leads will end up together, but Set doesn�t present this like a fait accompli, although most movies would do just that. Like everything else, the romance remains restrained. That�s probably one of the reasons Desk Set succeeds. It never beats us over the head with an agenda, as even its gentle anti-technology tone ends up in compromise. It includes some absurd plot devices � like the doomsday switch on the computer than happens to reside right in its middle � but it mostly comes across as light and likable. I don�t think anyone will regard Set as a real classic, but it seems charming and quietly amusing. 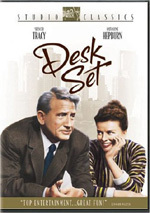 Desk Set appears in an aspect ratio of approximately 2.35:1 on this single-sided, double-layered DVD; the image has been enhanced for 16X9 televisions. The movie mostly looked very good and presented an impressive picture. Sharpness appeared positive. The image seemed distinct and detailed. Only a few minor examples of softness occurred. No issues related to jagged edges or moir� effects popped up, and only a sliver of mild edge enhancement marginally appeared. Print flaws appeared remarkably absent during this surprisingly clean and smooth presentation. The occasional speck cropped up, but very few of these defects manifested themselves throughout the flick. Set featured a natural palette that seemed well presented here. The colors came across as wonderfully vivid and lively throughout the movie, and I thought they looked quite solid most of the time. Black levels also appeared deep and rich, while shadows were nicely detailed and concise. Overall, the picture seemed very solid and fared quite well given its age. The stereo soundtrack of Desk Set seemed acceptable but not any better than that. Across the board, it felt like broad monaural. Music demonstrated light stereo imaging and that was about it. Some minor effects usage cropped up on the sides, but this remained a restrained track, so not much occurred. The mix made the dialogue less well centered than I�d like, as the speech spread across the front and lacked great localization. Audio quality seemed fairly average for the era. Speech occasionally suffered from some weak dubbing and came across as somewhat muddled and dull at times. In addition, lines occasionally bled to the side speakers, and a bit of edginess occurred. As with virtually all of these stereo remixes, Desk presented some echo effects not heard in the mono track, but this seemed less severe than usual. Music failed to display great vividness, but the score was acceptably dynamic and rich given its age. Effects also came across as reasonably accurate but without great range. Those elements failed to display problems but they also didn�t show much spark. Overall, the audio of Desk Set seemed acceptable for a film of this vintage. Not surprisingly, Lee�s comments focus on the facts and history while Merrill goes for a more experiential feeling. Actually, my indication that she offers a screen-specific track isn�t totally accurate; at times she does this, but usually she discusses aspects of her career unrelated to Set. Early on, she tells us anecdotes about her experiences on the set and with the other actors, and that gives us a nice look at life with Hollywood legends. After that she mainly talks about her work on other films, and she does so in a fairly blunt manner, such as when she relates her opinion of John Frankenheimer in no uncertain terms. Lee tends to come across as academic and seems to be reading his remarks. He lets us know the backgrounds of the performers as well as their work in the movies and various aspects of the shoot and the processes. We get some brief history of Cinemascope and a look at a few movie-making techniques. Unlike others such as Rudy Behlmer, though, he doesn�t talk much and fails to relate a lot of useful information. Merrill�s stories are often good, but it gets frustrating that she has so little to say about the movie at hand. Add to that many gaps in the commentary and it ends up as a decent but erratic piece. Next we find a Movietone News short. �Designers Inspired for New Creations By Film Desk Set� runs 58 seconds as it shows images from a fashion show. It�s not very interesting. We get a collection of ads. The disc includes the theatrical trailer for Grapes as well as promos for other Studio Classics. That domain contains promos for All About Eve, An Affair to Remember, The Ghost and Mrs. Muir, and The Seven Year Itch. In the Still Gallery we get 22 images. These include some candid shots from the set. An unassuming but entertaining romantic comedy, Desk Set never aspires to much, but it succeeds nonetheless. The movie gains from the charm of its cast and also benefits from a lack of pretension. The DVD presents excellent picture plus average audio and some decent extras, though it fails to compare with the supplements found on the best Fox Studio Classics DVDs. Still, with a low list price of less than 15 bucks, you can�t go wrong with this sweet and charming flick.